Let’s take a look at three reasons Hospira’s stock could fall. The market is very bullish on Hospira (UNKNOWN:HSP.DL), which has rallied impressively over the past 12 months. The maker of specialty injectable pharmaceuticals and medical devices has certainly been on fire -- revenue rose 11% year-over-year last quarter as adjusted earnings per share climbed 31%. Hospira topped off those strong results with higher top and bottom line guidance for the rest of the year. The company also announced that the FDA had cleared its troubled Rocky Mount plant in North Carolina, which has weighed on its bottom line for three years. It is also reportedly interested in acquiring Danone's medical nutrition unit, which could cut its corporate tax rate by moving to France and diversify its portfolio. While that's all great news for the bulls, investors should also look at three of the top contrarian arguments as well. But before we do so, investors should remember that while these points highlight Hospira's fundamental weaknesses, they do not guarantee that the stock will fall. One of Hospira's greatest strengths is its biosimilars portfolio, which contains generic versions of drugs like Remicade, Procrit/Eprex, and Neupogen. That's why it's ironic that one of Hospira's biggest drugs, Precedex, is being copied by its rivals. Precedex, a liquid sedative for intensive care units, accounted for 11% of Hospira's 2013 revenue of $4 billion. Novartis' (NYSE: NVS) Sandoz reached a deal with Hospira, which will allow it to launch generic Precedex in December. Sandoz isn't the only one interested in launching generic Precedex -- Akorn (NASDAQ: AKRX) informed Hospira in June 2012 that it also intended to sell generic Precedex. Hospira sued Akorn in April 2014, presumably to delay the company and other rivals besides Sandoz from launching generic Precedex. Therefore, investors should note that although Hospira raised its top and bottom line guidance for the full year, its growth could eventually suffer due to the loss of exclusivity for Precedex, despite the company's efforts to delay the inevitable. While it was encouraging that Hospira's Rocky Mount troubles finally ended, the company still has to contend with troubles in Costa Rica and India. The embargo of pumps made at Hospira's Costa Rica plant, issued by federal regulators last February, has been a big damper on the company's medical device business. After the FDA ban, Hospira signed a deal with Q Core Medical to launch the Sapphire system, a new infusion pump to replace the older GemStar line which was banned by the FDA due to the problems in Costa Rica. That move has propped up Hospira's medication management business, but the segment still posted nearly flat growth last quarter. Meanwhile, Hospira's plant in Irungattukottai, India was hit by an FDA warning letter last May over sterilization practices, followed by a follow-up inspection which resulted in nearly two dozen observations. To make matters worse, Hospira's new plant in India at Vizag -- which Hospira has already spent over $200 million on -- is being heavily scrutinized by the FDA. While Hospira doesn't have any identical competitors, Baxter International's (NYSE: BAX) Medical Products division (which sells pumps and injectables) is similar to Hospira's core business, while Teva Pharmaceutical (NYSE: TEVA) competes against Hospira with a similar mix of generic and specialty pharmaceuticals. 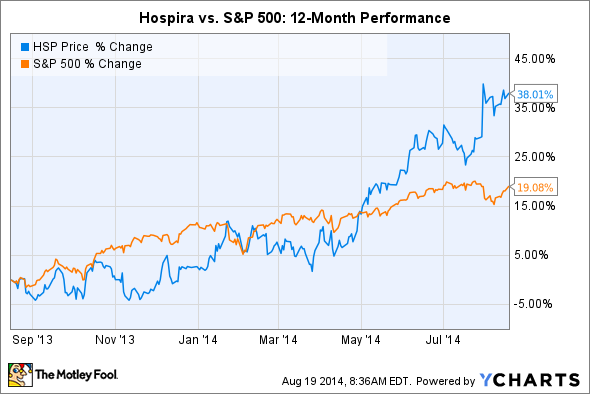 Hospira's stock trades at a considerable premium to both. Source: Yahoo Finance, Aug. 19. It may be unfair to compare Hospira to Baxter and Teva, which are both much larger and have less growth potential, but investors should note that Hospira trades with a trailing P/E more similar to high-flying biotechs than a maker of injectable drugs and medical pumps. This means that if the market gets dicey, Hospira could quickly lose its momentum and drop a lot faster than its larger rivals. In conclusion, investors should be aware that Hospira's robust top and bottom line growth could easily be weighed down by inevitable declines in Precedex sales and additional expenses related to plants in Costa Rica and India. Hospira is also rising with a lot of momentum, which means that it might need to take a breather to reconcile its stock price with its underlying valuations.